Did you know the average wedding guest takes over 50 photos and videos at the event? But how do you tell them exactly what you’d like to remember from your wedding? Give them a shot list of your favorite wedding moments to film on their phone! Here’s a great infographic to show you how to build your memorable wedding photo shot list in 5 simple steps. 1. How long is your wedding? 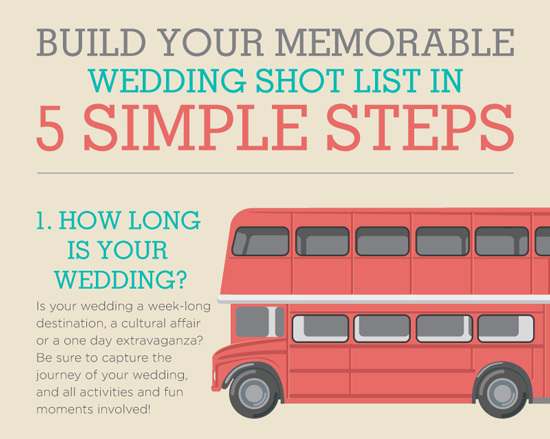 Whether it’s a multi-day cultural event, an exotic destination, or a one-day extravaganza, your first step in building your shot list is to determine the length of your wedding. 2. What pre- and post- wedding events do you have scheduled? Whether it’s pre-wedding scuba diving or post-wedding brunches, make sure to include them all on your list. 3. What wedding planning events do you have scheduled? Your wedding is more than one day; it’s a journey. Make sure all the memorable events make it on to your shot list… the bachelorette, showers, DIY disasters. They’re all part of your wedding and should be memorialized in your photos and video. 4. What about your wedding is most unique? Is your guest list a who’s who of famous family legends? Or did your pinterest dreams come to life? If your wedding were to be featured on Weddingbee, what photos would you submit? That’s what needs to go on the shot list. 5. How do you want to remember your wedding on your 5th anniversary? That’s what it’s really about. What tells the story of your wedding journey. Everyone’s wedding story will be as unique as they are. Tell your story through your shot list. Most importantly though, don’t just leave it on your shot list, or as numbered files on your computer. Let those wedding photos and videos really tell their story. About Ariane: Ariane Fisher is the Co-founder of Storymix Media. Their wedding video app WeddingMix is a fun way to crowdsource photos & videos from your friends into an edited wedding video. She is a regular contributor to Huffington Post and has been selected as a top 10 Emerging Entrepreneur of 2014 from Entrepreneur Magazine. Her great loves are bourbon, chocolate, and hockey. She is mom to 6, yes 6 kids. It’s loud.